This Bald Eagle nest is visible this year (2019) from our Chamber Visitor Center observation deck! Binoculars, spotting scope or good telephoto lens recommended. 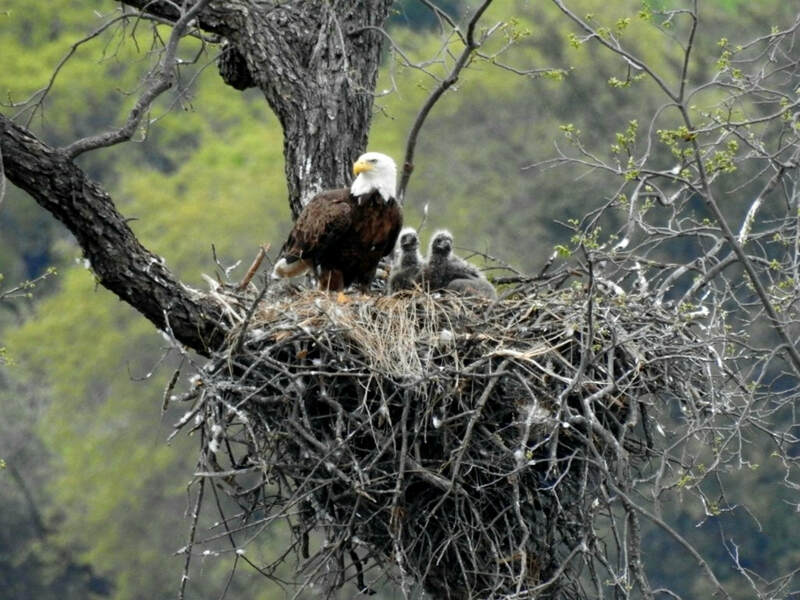 This pair has nested for several years between the Inks Lake bridge and Buchanan Dam and the nest was hidden, they have built this new nest which can now be viewed from a distance. Please note this is on LCRA private property and NOT accessible by the public. See additional pictures here. A special thanks to Harry Keil for all of these photos! Confirmed March 13, 2019 two eagletes are on the nest! New pictures added here. Lake Buchanan and Inks Lake are two jewels in the chain of lakes known as the "Highland Lakes", tucked between the Bluebonnet Capital and the Deer Capital of Texas. Lake Buchanan is big, wide, open, and uncrowded. Boat launching is currently available at Llano County Park, Cedar Point, Burnet County Park and many local lodges and resorts. Inks Lake is smaller, sheltered in a canyon and cozy. Inks Lake launch is at Inks Lake State Park. Fishing is great all year long!. 1937 photos of Fall Creek Falls before Buchanan Dam was completed. Caught from Inks Lake below the old Hwy 29 bridge. 108 lbs. If you fish for Striped Bass, Hybrid "Sunshine" Striped Bass, Black Bass, White Bass, Crappie, Catfish (Blue, Channel and Flathead,) or Sunfish Lake Buchanan and Inks Lake are where you want to visit. We have had phenomenal fishing this Spring and it looks like it will only continue to get better. In 2017 the Lake Buchanan Conservation Corp with help from a Llano County Hotel Tax grant and Texas Parks and Wildlife stocked over 1,000,000 hybrid striped bass into the lake. The hybrids are a cross between a striped bass male and a white bass female resulting in the Sunshine strain of hybrids. With their help, Lake Buchanan has become one of the top three striper lakes in Texas! Click here for more fishing info. Enjoy a day on the water. Bring your own boat or rent a watercraft of your choice and have some fun! Eagles, Osprey, Herons, Pelicans, Painted Buntings and many more birds can be found for everyone who enjoys bird watching. A wonderful slideshow with many eagle and local area images from photographer Jim Baines is available, click here. Cycling in the Upper Highland Lakes area. Enjoy four seasons of great escapes. If you have any questions while planning your visit here, please CONTACT US and our staff will be happy to assist you. Our Visitor Center is located at 19611 E Hwy 29 just West of the Inks Lake bridge. Free maps!